The most common email I receive regarding this program is from people using non-English versions of Windows where the Administrators group has a different name, and therefore the program cannot find the group to get the members from. There was an option to enter a language specific version for the Administrators group in the File –> Options window, but this was still not ideal if you have more than one language OS being used in your environment. Of course I would have preferred to make the program locate the Administrators group by SID instead of the name, but the problem is the WinNT provider does not allow you to bind to a local group via SID, so the only way to do this is to get a list of all groups on the computer and then loop through them until you find the one with the correct SID. Originally I decided against this method as it was less efficient and slower, so I made it use the group name instead but added the option to specify a language specific version of the group name in the File –> Options window. However, as a lot of people either didn’t find this option or had more than one language being used in their network, I still got a few emails about this. So I have now changed the program so that by default it will use the method of looping through all groups until it finds the group with the Administrators SID. This is slightly slower, but means there will be no language issues. 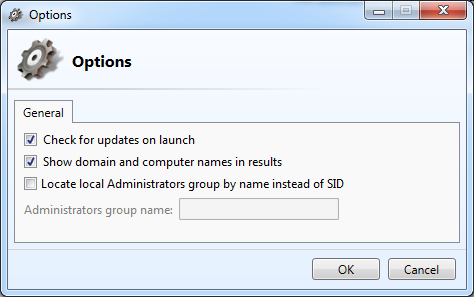 For anyone that is only using one language OS on their network, you can switch back to the old method by going to File –> Options –> tick the option titled “Locate local Administrators group by name instead of SID” and enter your language specific version of the Administrators group. Random tip: Although this tool was only designed to get members of the local Administrators group, there’s nothing stopping you enabling the option mentioned above and then entering the name of any other local group that you want to get members from. Starting and stopping the RemoteRegistry service before and after a scan would be a really nice feature. Windows Vista and above have this service set to manual.by default. We have just finished adding this feature – the update with this in will be released in a few days once a couple of minor bug fixes have been completed.